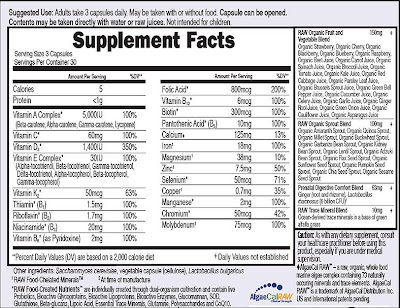 When I think of trying new prenatal vitamins, I always think to myself "what on earth makes this vitamin better than any other?" And I was pleasantly surprised when I found out that Vitamin Code's Raw Prenatal vitamin is different and much better than its competitors. It not only gives you the benefits of all of the vitamins a pregnant/nursing woman needs, but it also gives immune system support to you and your baby. Vitamin Code's vitamins are also "uncooked, untreated and unadulterated, with no binders or fillers, no soy allergens and always vegan, dairy-free and gluten-free." Another question I think about is, "will this vitamin make me nauseated or throw up in early pregnancy?" Vitamin Code takes care of this by adding ginger, which is known to help settle a queasy stomach. Not only that, but it also includes lactobacillus, which is a probiotic, to help with digestion. Folic acid is extremely important in early pregnancy, and the CDC recommends that women of childbearing age take at least 400mcg of folic acid to support healthy neural tube development should a pregnancy occur. The raw folic acid in this vitamin is created from food, so it is easy for your body to absorb and use, and Vitamin Code puts 800mcg in one serving (3 capsules). That's 2x the CDC's recommended dosage! In addition to all of this, there is also a raw organic fruit and vegetable blend as well as a raw organic sprout blend in every capsule. In my opinion, you do not get much better than this! 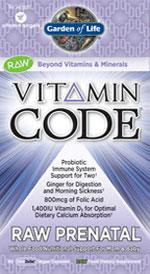 Win a bottle of Vitamin Code's Raw Prenatal Vitamins! First, you need to publicly follow this blog and/or subscribe on Google Reader. Then comment here and tell me what concerns you most when choosing a prenatal vitamin. 10) Get an unlimited number of additional entries for entering other The Twinners giveaways (1 additional entry per giveaway). Comment here to let me know which other giveaways you're in! 11) Vote for this blog by clicking each of the following icons for 1 additional entry per click (a total of 3 additional entries!) Make sure to comment 3 times to let me know you clicked for each one. This giveaway will close on March 6, 2010 at midnight. When I look for a prenatal vitamin, I am looking for something that I (eventually a baby) can benefit from. I don't care for any that have extra ingredients that your body doesn't use. I look for the maximum number of nutrients, and the minimum number of fillers. But also one that is gentle on my stomach. I also want to make sure that it doesn't have "too much" of some vitamins (and I look to see if the calcium and iron are formulated (or one is not included) to maximize how my body uses them. Just became a fan on facebook! Even if I don't win, I am definetly going to check into getting these prenatal vitamins! Just stumbled this post. Hope everyone has a great day!! Just clicked the TOPMOMMYBLOGS.COM button and voted. Just clicked the TopBabyBlogs.COM button and voted. Just clicked the I am a Top Mommy Blogger button and voted.